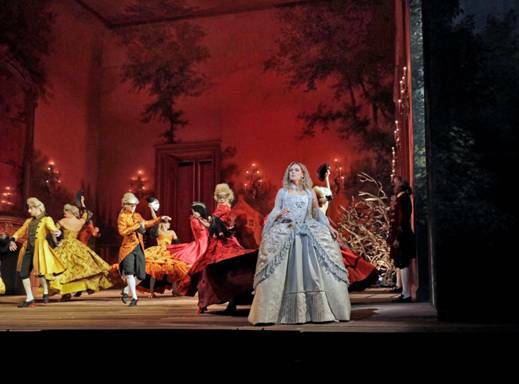 SAN JOSE, CA – From our chair in the Century 20 Oakridge and XD Theatre in the city, we entered the world of the imagination in HD (High Definition) the moment that the red curtain of the Metropolitan Opera in New York City opens on the screen. The first ANTONIN DVORAK's seven notes followed by a somber cello solo, of the overture of “RUSALKA, are enough to express the pathos of the Opera. The work itself, was masterfully interpreted the Metropolitan Opera’s Orchestra, conducted by SIR MARK ELDER. 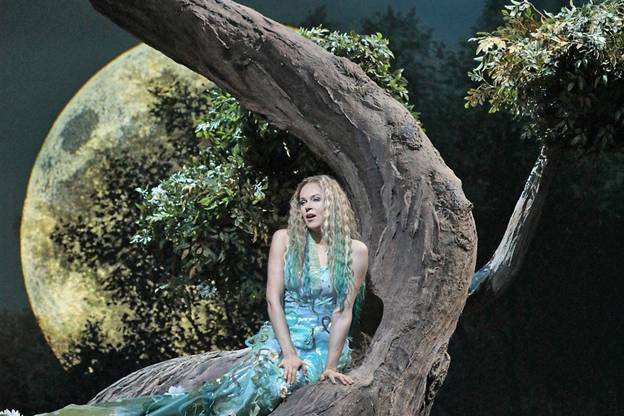 As we look at the stage, the set, designed by DANIEL OSTLING combined with the creative costumes of MARA BLUMENFELD, immediately transport us to a semi-dark forest where the Wood nymphs, wearing short skirts embroidered in flowers, tease the Water Gnome (ERIC OWENS) asking him to safe them, dancing and flirting in jest, with him as he observes them from the water pond. Crawling out of the pond (She has no legs) RUSALKA (OPOLAIS) the Water Gnome’s daughter , manages to reach a tree, where she sits singing to the moon, in a crystalline sounding tone her aria, known as Singing to to Moon, in which she expresses her unhappiness and her longings to become human and have a soul, (The Nymphs have no souls) because she had fell in love with the human prince who comes to hunt in the forest. 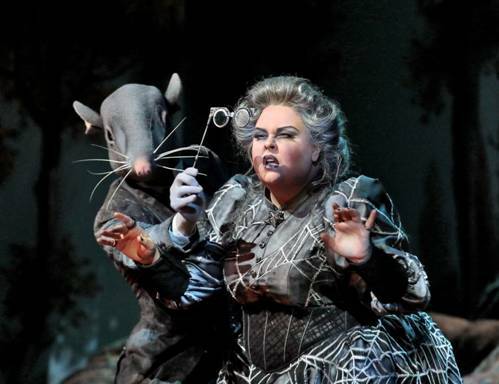 In a wickedly impersonation of JEZ IBABA the witch of the forest, whose experiments had left a human, half human and half donkey, another with the head of a mouse, and a third one with the head of a crow, Mezzo Soprano JAMIE BARTON, dressed in a black dress adorned by cobwebs, promises to help Ruzalka but at a very high prize. The moment Rusalka turns human, she will not be able to talk, and if she fails in finding love, and her human prince forsakes her, she will be damned and her lover will die. Rusalka accepts the conditions. She drinks the magic potion, gets a human body and gets a human soul. After that, she sits in the forest to wait for her prince (BRANDON JOVANOVICH). When he finds her, looking to pure and so beautiful, it was love at first sight. He picks her up in his arms and carries her to his castle. In his melodic sounds and in his harmonizations. If one listens to the music carefully, one notices that to express the emotions required in the production, DVORAK created a repertory of sounds, in Motifs, Forms, and tonal coloring, to represent the different emotions in synthesized impressionistic styles, which managed to convey the story’s feelings to the audience in melodies influenced by the inclusion of folk elements and impressionistic techniques influenced by the classical forms of LIST and RICHARD WAGNER. The sound of the music, becomes “European” in the next scene, representing the Prince's palace , that in this production is sumptuous, with red-wine color walls covered in either silk satin with with prints of trees, and elaborate gold candelabrum hanging on the walls. At the ball, celebrating the Prince and Rusalka’s forthcoming nuptials, the elegantly-attired servants walk around carrying the food and flowers they are going to set on the tables and stop to gossip about the Prince’s bride who has not uttered a single word (she cannot speak anymore) since she arrived at the palace. And it is while wondering in the palace, that in one of the rooms she sees the foreign Princess (KATARINA DALYMAN) flirting with the prince, hears the prince confessing his love to the Princess and sees them kiss. Rusalka returns to the forest. She summons Jez ibaba who tells her that the only way now that she could save herself is for her to kill the Prince and gives her a knife. She refuses tossing the knife on the pond. 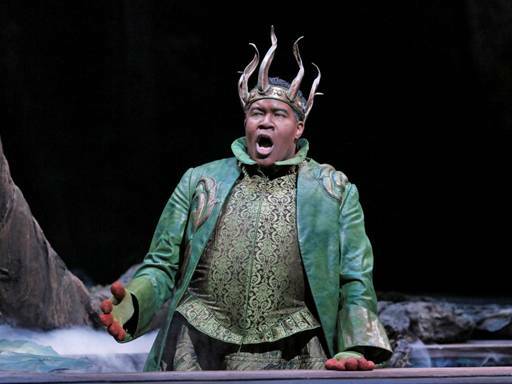 Full of remorse, the now sick Prince comes running to the Forest looking for Rusalka. She finally allows him to find her, and when they meet, she explains to him that if she kisses him, he will die. He begs her to kiss him, to give him peace and after she does, he dies in her arms. For his final scene, DVORAK reserved his more lyric melodies. Passionate, impregnated in sadness. Tender, interpreted in soft tones. Perfectly sung in the magnificent voices of OPOLAIS and JOVANOCIH, they moved us to the core. On our HD performance, of RUSALKA, the orchestra, the voices, the settings the costumes, the lighting, everything contributed to the Magic of the fairy tale story.